The latest poll from Mason-Dixon Polling & Research, taken in early October, shows that current support still falls short of the 60 percent majority needed for the passage of Amendment 2. That in itself is good news, especially if one keeps in mind the earlier Quinnipiac poll taken in early September, which also shows less than 60 percent support for the amendment. But a rise in undecideds from 7 to 11 percent is troubling, and suggests that they might break for supporting the amendment. The article below is from seaqwa, a gay online newspaper in Seattle. TALLAHASSEE -- Support for Florida's anti-gay "marriage protection" amendment on the Nov. 4 ballot continues to fall short of the 60 percent needed for passage, a new poll shows today, but may be poised for approval. Support for Amendment 2, which limits civil marriage to one man and one woman only, dropped from 57 percent in August to 55 percent in early October, according to Mason-Dixon Polling & Research. 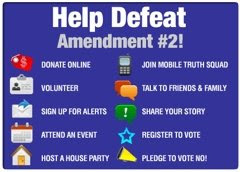 But the difference falls within the 4 percentage point margin of error for the poll; meanwhile, the number of voters who remain undecided on Amendment 2 rose from 7 percent to 11 percent. All told, the results remain comparable to the outcome of Mason-Dixon's August survey, Tampa Tribune reports. Of the 625 registered voters surveyed Saturday through Monday, 55 percent supported the anti-gay marriage amendment, while 34 percent were against it. It takes a 60 percent vote to approve a constitutional amendment in Florida. But Mason-Dixon polling director Brad Coker warned the the number of undecided voters in the survey might indicate problems for opponents of the amendment, Orlando Sentinel reports. Undecided voters made up 11 percent in the poll, and Coker said experiences in other states that have considered the issue suggest that undecided group is more likely to back the ban. "There just seems to be the trend where the undecided voters just sort of fall down on the anti-gay side," said Coker. The measure is the only one of six proposed constitutional changes headed to voters Nov.4 that is close the 60 percent threshold needed to pass, an Orlando Sentinel poll shows. Coker said that undecided voters casting a ballot in favor of the marriage amendment would probably give it with the additional 5 percentage points it needs to pass. But not if Florida Red & Blue can help it. The group plans to run an ad painting the amendment as ''vague'' and a threat to domestic-partner benefits, even for heterosexual seniors. Supporters of Amendment 2 say that's a scare tactic. Gov. Charlie Crist said he supports defining marriage ''between one man and one woman.'' Yet Crist said he's staying out of all the amendment fights because "I've got my hands pretty full as it is," Miami Herald reports. Pollster Coker observed that voters considering the crowded Florida ballot have clear opinions about those amendments that are relatively easy to understand or that have simple titles or buzzwords, but are less likely to support complex measures. Large numbers of voters remained undecided on the other questions appearing on the presidential election ballot. So the ''Florida Marriage Protection Amendment'' garners wide support -- 55 percent in support; 34 percent opposed. And a complicated amendment that would allow local communities to raise the sales tax to help pay for community college is losing by a 37 to 40 percent margin, Miami Herald reports.